I’ve fallen in love with cowboys. Not Louis L’Amore’s country-drawling, quick-on-the-draw, old-time Wild West fictional characters. Not the iconic John Wayne hero-types who were popular with past generations. I’m enamored with real-live, adrenaline junkie, God-fearing, patriotic, chaps-wearing, bucking-bull-riding men. In ten-gallon hats or protective helmets, these guys—who individually race the clock astride a two-thousand-pound-angry bull that could quickly maim and easily kill—are themselves a bona fide US prime cut of the finest. National treasure. Displaced from Michigan, I embraced Western culture by attending “The 5th Annual Castle Rock Bull Riding Show” at Douglas County Fairgrounds in Colorado. Forty-seven courageous men and four equally bold youth came prepared to test their strength and endurance against the unleashed roller-coaster-like forces of agitated and intimidating four-legged opponents. One by one, the cowboys enter the competition ring and are introduced. The audience applauds continually, and the line of bull-riders grows. Seeking support from family and friends, the brave contestants search for familiar faces among the crowd and wave. There’s hootin’ and hollerin’ all the while, until the four mini-bull riders make their way to the end of the line. The announcer invites active military and veterans to stand. Respectfully, cowboys remove their hats and place them over their hearts. The men and boys on the field join the applauding audience in cheering. I feel thankful for the men and women who are being acknowledged for their service. I think of the young men from church—twins who graduated from West Point and are now stationed in Afghanistan. Alec and Anthony are about the same age as my eldest son, whom I get to hug and kiss hello when he comes home from work each day. I miss my own twin boys who are away at school, and they’re only an hour’s drive away from our suburban neighborhood. I’m not sure I could manage my worry if any of my children followed a calling to serve, like Alec and Anthony have. Instilling additional honor and respect, four members of the Fort Carson Mounted Color Guard enter the ring. Their horses increase the number to eight. The soldiers wear replicate uniforms from the 1800’s, although in my inexperience I think they look like they could be from the American Civil War period. The front and rear army representatives each carry a saber over their right shoulder. The US Flag is on the second mount; the Colorado state flag is with the third. A recording of “Proud to be an American” by Lee Greenwood blasts throughout the arena. I’m overwhelmed when I consider the number of men and women who have fought for our liberties and freedom. Throughout our long history, generations have pledged their allegiance to and risked their lives for the USA. The army soldiers stop behind the center of the cowboy line and face us spectators. For several years, I’ve been disheartened by the lack of respect shown to our country’s flag. It seems to me that when you disrespect it, you’re disrespecting all the people who have sacrificed for our country: People like my nephew who serves in the army and my great uncle who served in the navy. Veterans I never knew, like the Tuskegee Airmen. Fallen marines, like my friend’s son who was honored with a twenty-one-gun salute at his funeral. People I dearly love, like my dad who was in the air national guard and jokes that he won’t ever fly again because airlines don’t give out parachutes. I’ve seen overwhelming indifference to the flag first-hand, most often during the singing of our national anthem at public events as big as Major League Baseball games and as common as high school soccer matches. Why do some not care to honor the very symbol that represents our country and should be a source of pride? I naively like to assume that people just don’t know or remember how to honor our Stars and Stripes. Is the protocol even taught in schools anymore? Or has it become taboo, like professing faith in Jesus? Cowboys won’t tolerate neglecting God nor Country. A pastor is introduced. He instructs us to bow our heads in prayer. I sneak a peek at those darn cowboys. The sight of them on bended knees surprises me. 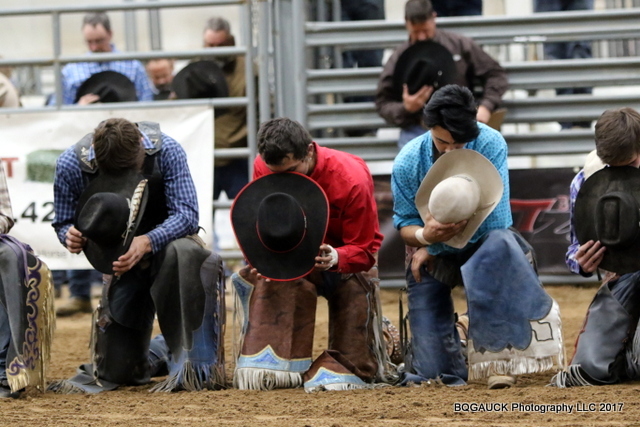 It’s rare to see such unity of spirit outside church or other Christian gathering, but cowboys get it. They know a successful bull-ride and walking away uninjured is in God’s hands. Many wear a symbolic cross on their chaps to remind themselves that He is with them. These men of faith understand their very lives are dependent upon God’s will, and so they show reverence for Him. Seeing that is alone worth the price of admission. The sound of bagpipes fills the stadium as the pastor leads us in prayer for the military who fight for “freedom in every country where their boots hit the ground as they stand against tyrants and terrorists.” We pray that the cowboys will “keep their weight in the middle and their spurs moving fast” and that the bulls will “jump high and hard.” We pray for the safety of the bull fighters, the bulls, and the workers in the pens and chutes. Cowboys go beyond the basics of knowing what to do during “The Star-Spangled Banner.” They hear the music of our national anthem, they stand, they turn to face the flag. They remove their hats from atop their heads and—placing their hats over their left shoulders—cover their hearts with their right hands. But that’s just the beginning to their outward expression of respect. Properly honoring God and expressing love for the USA are two ideals that are so important they are made a priority in rodeo and in everyday life. The real men of Colorado have their priorities straight. *As a Professional Rodeo Cowboys Association Photographer, Brian Gauck captures bull-riding stories by preserving the calm, quiet, reflective moments as well as the heart-stopping action of competitions. He covers many other events too. View more of Brian’s work by following this link: https://bqgauckphotography.smugmug.com/. You may also visit his Facebook page, BQGAUCK Photography. Note that Brian’s photos are copyright protected and I’m thankful he granted me use of this one! More about Brian: He’s retired from the U.S. Navy and has been living in Colorado since 2002. Besides being a PRCA Photographer, he’s a volunteer coach for the United States Air Force Academy Rodeo Team. He’s also a Pikes Peak Range Rider and has been married for nearly thirty-three years to Kelly Gauck. God, country and cowboys – the natural order. Great post. I’m glad you see it the way I do! Thanks, Karen. Thanks. It’s always nice to get your feedback. Great read, Kelly! If more people felt this way our lives, as human beings, would be more attuned to one another. Thanks for seeing a thread of kindness in this piece, Wendi. I miss seeing you. Sending peace and love your way….